Arthur Pewty's maggot sandwich: A 75th anniversary. Erith is receiving extra money from the London Mayor’s Good Growth Fund. The cash will be used to improve several public areas around the town, including the Riverside Gardens (pictured above - click on the photo in order to see a larger version). In an interview with the News Shopper, Councillor Louie French, Bexley’s deputy leader and cabinet member for growth, said: “I am delighted this latest round of funding will see the Riverside Gardens rejuvenated and refurbished based on designs developed in partnership with local residents and community organisations. 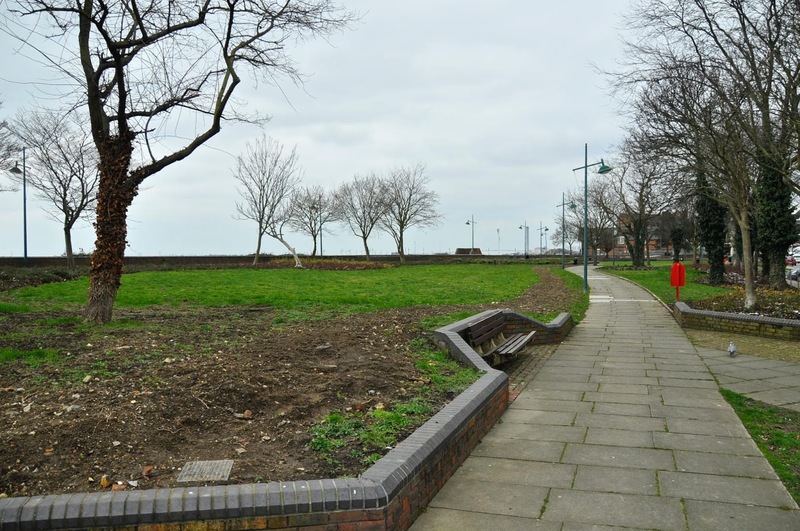 The project will upgrade this much-loved open space to improve visibility of and engagement with the river, creating opportunities for the community to use the gardens for play, leisure activities, planting and learning." The historic Carnegie Library in Walnut Tree Road has received similar funding, and the official opening event of the Bookstore Cafe within the building by The Exchange is scheduled to take place on the 14th February. You can read details about it here. The mystery surrounding Electricity House deepens. Regular readers may recall that the large 1930's brick building opposite the De Luci fish roundabout and Pier Road. The building contains a number of businesses and other organisations. In recent times the building has had a somewhat rocky time. Part of the building was home to the Bright Steps children's nursery, until it was shut down by the Police and officers from Ofsted after a member of nursery staff was seen hitting a child, and the nursery owner tried to cover the crime up. After an unsuccessful court appeal against the ban, the owners of the nursery put it up for rent. This is all under a background of Bexley Council negotiating with the individual leaseholders in order to buy out the leases in Electricity House prior to what I and many others believe to be a compulsory purchase order and then site redevelopment. A new nursery provider took up the lease of part of the building. The nursery was originally called The Carnegie Playhouse, but shortly changed its name to The Bexley Road Nursery. Some building refurbishment work was undertaken, but for the last couple of weeks no activity has been observed on the site. I have Emailed the nursery owner asking for an update, but so far I have not had a response. In the meantime, the African church which has been using The P2 Events Centre - the shabbily converted former snooker club, located on the upper floor of the large building - have now moved out, and they are now holding their services in the White Hart African restaurant and wine bar. You may recall that last year the White Hart controversially submitted a request to Bexley Council licensing in order to stay open until 5am every day. Understandably this was thrown out. One other issue that came up at the licensing meeting was that the White Hart had converted the former beer cellar into an events space and an overspill area from the restaurant upstairs. The problem with this was that there is no fire escape - there is only a single staircase in and out of the lower floor area. Because of this, both Bexley Council planning team and the London Fire Brigade forbade the owners from using the former beer cellar until extensive alterations to create a fire escape had been made. Some locals have expressed concern that the church may be illegally using the former beer cellar area in order to hold their services, but at the time of writing, I have no solid evidence to back this up. Whatever is happening, things are changing, and the businesses located in Electricity House are gradually closing up as their leases are bought up by Bexley Council; I have it on reliable authority that the long established shoe repairer and key cutting shop called Soles and Heels. on the corner of Pier Road and Cross Street is soon to be no more. The council surveyors have been in to measure the place up prior to making the owners an offer that they will not be able to refuse. 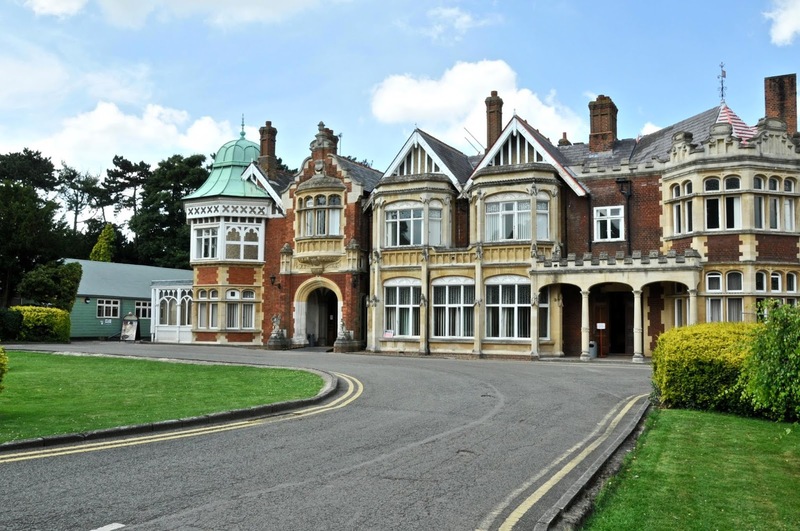 Nowadays many people are familiar with the ground breaking work done by hundreds of men and women during World War II at Bletchley Park to break the Axis ciphers, which are said to have shortened the war by around two years. Much has been made of the work by Alan Turing, Gordon Welchman and the hundreds of mathematicians, linguists, statisticians, cryptanalysts and administrative staff who worked to crack the Enigma Code, and several films and documentaries have been made on the subject, including the absolutely terrible film, The Imitation Game, which is horrendously historically inaccurate, and actually fabricates much of the story. Nevertheless, the work carried out in utter secret was absolutely vital to the Allies eventual victory. What is far less well known is the story of how Station X (the code name for Bletchley Park) broke the cipher used by Germany's high command, which was even more fiendishly complex and hard to break than the already formidable Enigma Code. Tuesday of last week marked the 75th anniversary of the first use of a digital, programmable computer, which not only substantially eased wartime code breaking, but went on to change the world - and it all started in a draughty shed near Milton Keynes. I digress; The cipher used by Hitler and his top generals was called the Lorenz Cipher. Lorenz used a massively modified electrical teleprinter. Teleprinters are not based on the 26-letter alphabet and Morse code on which the Enigma machine depended. Teleprinters use the 32-symbol Baudot code. Note that the Baudot code output consists of five channels each of which is a stream of bits which can be represented as no-hole or hole, 0 or 1, dot or cross. The system enciphered the message text by adding to it, character by character, a set of obscuring characters thus producing the enciphered characters which were transmitted to the intended recipient. The simplicity of the Lorenz system lay in the fact that the obscuring characters were added in a rather special way (known as modulo-2 addition). Then exactly the same obscuring characters, added also by modulo-2 addition to the received enciphered characters, would cancel out the obscuring characters and leave the original message characters which could then be printed. The Lorenz machines at each end of the communication link had to be set up with the same cipher key in order to effectively communicate. The difficulty was how to ensure, in a hot war situation, that the same random character keys were available at each end of a communications link and that they were both set to the same start position. The Lorenz company decided that it would be operationally easier to construct a machine to generate the obscuring character sequence. Because it was a machine it could not generate a completely random sequence of characters. It generated what is known as a pseudo-random sequence. Unfortunately for the German Army it was more "pseudo" than random and that was how it was broken. Brigadier John Tiltman, one of the top codebreakers in Bletchley Park, took a particular interest in these enciphered teleprinter messages. They were given the code name "Fish". Because the Lorenz system depended on addition of characters, Tiltman reasoned that if the operators made a mistake and used the same Lorenz machine starts for two messages (known by codebreakers as a depth), then by adding the two cipher texts together character by character, the obscuring character sequence would disappear. He would then be left with a sequence of characters each of which represented the addition of the two characters in the original German message texts. For two completely different messages it is virtually impossible to assign the correct characters to each message. Just small sections at the start could be derived but not complete messages. As the number of intercepts, now being made at Knockholt in Kent, increased a section was formed in Bletchley Park headed by Major Ralph Tester and known as the "Testery". A number of messages were intercepted but not much headway had been made into breaking the cipher until the Germans made one horrendous mistake. It was on 30 August 1941. A German operator had a long message of nearly 4,000 characters to be sent from one part of the German Army High command to another — probably Athens to Vienna. He correctly set up his Lorenz machine and then sent a twelve letter indicator, using the German names, to the operator at the receiving end. This operator then set his Lorenz machine and asked the operator at the sending end to start sending his message. After nearly 4,000 characters had been keyed in at the sending end, by hand, the operator at the receiving end sent back by radio the equivalent, in German, of "didn't get that — send it again". They now both put their Lorenz machines back to the same start position. This was absolutely forbidden, but they did it. The operator at the sending end then began to key in the message again, by hand. If he had been an automaton and used exactly the same key strokes as the first time then all the interceptors would have got would have been two identical copies of the cipher text. Input the same — machines generating the same obscuring characters — same cipher text. But being only human and being thoroughly bored and disgusted at having to key it all again, the sending operator began to make differences in the second message compared to the first. The message began with that well known German phrase SPRUCHNUMMER — "message number" in English. The first time the operator keyed in S P R U C H N U M M E R. The second time he keyed in S P R U C H N R and then the rest of the message text. Now NR means the same as NUMMER, so what difference did that make? It meant that immediately following the N the two texts were different. But the machines were generating the same obscuring sequence, therefore the cipher texts were different from that point on. The interceptors at Knockholt realised the possible importance of these two messages because the twelve letter indicators were the same. They were sent post-haste to John Tiltman at Bletchley Park. Tiltman applied the same additive technique to this pair as he had to previous Depths. But this time he was able to get much further with working out the actual message texts because when he tried SPRUCHNUMMER at the start he immediately spotted that the second message was nearly identical to the first. Thus the combined errors of having the machines back to the same start position and the text being re-keyed with just slight differences enabled Tiltman to recover completely both texts. The second one was about 500 characters shorter than the first where the German operator had been saving his fingers. This fact also allowed Tiltman to assign the correct message to its original cipher text. Now Tiltman could add together, character by character, the corresponding cipher and message texts revealing for the first time a long stretch of the obscuring character sequence being generated by this German cipher machine. He did not know how the machine did it, but he knew that this was what it was generating. This manual cracking of the Lorenz Cipher proved that it could be broken, but it was far too slow and laborious to be used in any kind of practical manner. What would massively accelerate the breaking of Lorenz enciphered messages would be if there was a way to automate the comparison of the hundreds of messages that were transmitted by the Nazis every day. This is where Colossus - the world's first, digital, programmable computer came in. Built by the Post Office at their research and development laboratory in Dollis Hill, and designed by a largely unsung genius called Tommy Flowers. Colossus was huge - hence the name, and used thousands of thermionic valves (what the Americans call tubes) to operate. Colossus reduced the time to break Lorenz messages from weeks to hours, and sometimes even minutes. Colossus read teleprinter characters, in the international Baudot code, at 5,000 characters per second from a paper tape. These characters were usually the intercepted cipher text which had been transmitted by radio. The paper tape was joined into a loop with special punched holes at the beginning and end of the text. The broad principle of Colossus was to count throughout the length of the text the number of times that some complicated Boolean function between the text and the generated wheel patterns had either a true or false result. At the end of text the count left on the counter circuits was dumped onto relays before being printed on the typewriter during the next read through the text, an early form of double buffering. It was just in time for the deciphering of messages which gave vital information to Eisenhower and Montgomery prior to D-Day. In effect Bletchley Park were "reading Hitler's Email". These deciphered Lorenz messages showed that Hitler had swallowed the deception campaigns, the phantom army in the South of England, the phantom convoys moving east along the channel; that Hitler was convinced that the attacks were coming across the Pas de Calais and that he was keeping Panzer divisions in Belgium. 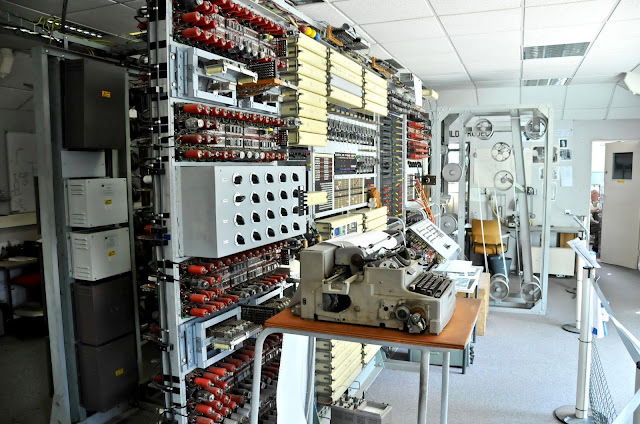 Colossus was so good at deciphering Nazi High Command messages that there were many instances when the cryptographers at Bletchley Park were reading decrypted messages before Hitler did! After D-Day the French resistance and the British and American Air Forces bombed and strafed all the telephone and teleprinter land lines in Northern France, forced the Germans to use radio communications and suddenly the volume of intercepted messages went up enormously. The Mark 1 had been rapidly succeeded by the Mark 2 Colossus in June 1944 and eight more were quickly built to handle the increase in messages. The Mark 1 was upgraded to a Mark 2 and there were thus ten Mark 2 Colossi in the Park by the end of the war. By the end of hostilities, 63 million characters of high grade German messages had been decrypted — an absolutely staggering output from just 550 people at Bletchley Park, plus of course the considerable number of interceptors at Knockholt, with backups at Shaftesbury and Cupar in Scotland. The first Lorenz enciphered message to be cracked by Colossus happened 75 years ago last week - and it changed the world, launching the computer age. You may recall that last week I wrote about the Metropolitan Police who are in the midst of what it is calling a trial of automated facial recognition (AFR) technology, although it has been using the kit since 2016. Last week it used the kit in Romford, parking a van outside the station between 10am and 6pm. The cameras scan the faces of passersby and checks them against a watch list that is supposed to be freshly drawn up for each deployment. Forces have argued the public expects them to use emerging tech to improve policing, but critics railed against the fact it is being tested in live environments without a legal framework and in the face of evidence it has a 98 per cent false positive rate. Last week's deployment was due to be the final one before a full analysis, but snow meant that the second day had to be rescheduled because footfall would be lower than is required by the tests. The Metropolitan Police have yet to provide details of where and when this will be – info about the Romford trial was only released at 4pm the day before. The problem is not with identifying and tracking criminals, which I am sure pretty much everyone applauds, but the fact that the technology currently deployed simply does not work as advertised, and the extremely high rate of false positives means that potentially passers by can be identified as a wanted criminal when in reality they are completely innocent. What do you think? Leave a comment below, or alternatively Email me at hugh.neal@gmail.com. 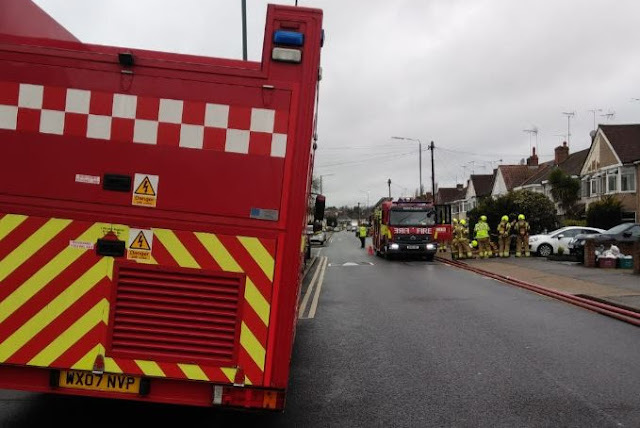 Image:- Fire fighters attending a property in Parkside Avenue, Barnehurst on Monday which resulted in the discovery of a cannabis factory. "Not a bad week crime wise across the ward with no burglaries reported. There has been an increase in theft from motor vehicles offences with five being reported in Hillingdon Road since Wednesday 30th January. All offences have occurred overnight. There has been no damage to vehicles and property including electrical items, sunglasses and small change has been taken. Please make sure that your vehicle is locked securely, do not rely on the electronic fob always check manually that your vehicle is locked. The team will be adjusting their duties and will be carrying out both uniformed and plain clothes operations at the relevant times. On Monday 4th February the fire service responded to a house fire in Parkside Avenue, the property was seriously damaged and whilst fighting the blaze a cannabis factory was discovered across the first floor of the house. Police attended and approximately 150 cannabis plants were seized from the property. Enquires are continuing in regards to potential suspects identified regarding the cultivation. Most cannabis factories are situated in residential streets, normally the electricity is by passed and with the heat generated from the hydroponic set up creates a major fire hazard. If you have suspicions that a property is being used to cultivate drugs please call the local policing team with details. If you do not want to talk to the police consider calling Crimestoppers on 0800 555 111 this is completely anonymous and you do not have to give any personal details. Thankfully nobody was injured during this incident, however this was only due to the quick response from the fire service and the skill of the crews tackling the fire which prevented the blaze from spreading to neighbouring properties. A member of the team will be at Barnehurst Golf course on Tuesday 12th February at 11am. Please come along for an informal chat about any concerns or issues that you may have or just pop in to say hello. As always we can be found on twitter @MPSBarnehurst and Facebook, just search for Barnehurst Police". Belvedere ward:- "The team began this week by attending Belvedere Junior school in order to monitor parking and traffic along Lower Road, directly outside of the school after concerns were raised by both the school and Bexley Council. This has historically been an issue and the team are hoping to attend more regularly with partner agencies to take the necessary action against any person(s) that are found to be committing offences. We have now been advised that the elder of the two men that were sleeping rough on the site of the disused Belvedere Police station has been housed. A great deal of work took place by not only ourselves but several outreach workers and Bexley Council officers to assist the male with his health issues and he is now hopefully in suitable accommodation. We are aware that the younger male seems to have repositioned himself further along Nuxley Road and we are still working toward a suitable outcome for this male also. With the help of Ian Holt, the estate manager of the Lesnes Abbey heritage site, the team have recovered a safe that had been discovered discarded in bushes at the entrance to New Road. This has been stored in a more secure area at this stage and appears to have been taken from a house in the Welling area during a burglary. We are in the process of contacting the rightful owner in order to restore their property to them. Over the weekend the team responded to a call for Police as youths were apparently causing a nuisance in both Tennyson and Scott Houses in Albert Road. Unfortunately there was no sign of the group when we arrived at the location however we will continue to patrol areas such as this on a regular basis. Finally, the team visited a resident of Woodland Way who had reported a male that had been caught on CCTV from the property. He had been walking along Woodland Way in the early hours of one morning recently and was trying to open car doors. He eventually managed to enter a vehicle that had not been locked overnight, although he did not take anything from the vehicle as no items of value were left in the car by the resident. No other damage was caused to the vehicle however the team would advise that you always lock and secure your vehicle even if leaving it unattended for the shortest time. Also, never leave items on display within your vehicle. Place items where they cannot be seen (glove box or boot) or take any valuable items from the car when you exit your vehicle. Our next Community Contact session is due to take place on Friday 15th February at the Asda café from 12 noon". Bexleyheath ward:- "There has been one report of a burglary along Bedonwell Road Bexleyheath on the Friday 01/02/2019, method of entry is unknown. Saturday 02/02/2019 – Report of a theft from motor vehicle, outside Asda store Bexleyheath; Wednesday 30/01/2019 – Report of an interference with a motor vehicle along Hyde Road Bexleyheath. A theft of purse was report on the Monday 04/02/2019 along the Broadway Bexleyheath between 3.30 and 4pm; On the Monday 04/02/2019 - A male was stopped along the skate park in Bexleyheath for possession of cannabis. The team has received reports of males on bikes causing anti social behaviour in the carpark area at the Premiere Inn, patrols are conducted daily. If you do wish to pass on information to Police then please contact Crime Stoppers on 0800 555111. Please do not hesitate to contact us via Twitter, Facebook, email and the ward phone. If you are after crime prevention advice, please look at the Met Police website which has lots of information that you may find useful. Remember in an emergency please dial 999 or 101 for non-urgent reporting". Crayford ward:- "Number plates were stolen from a Ford Transit parked to the rear of a business by Crayford Parade between Friday 25th and Monday 28th February. On Thursday 31st January a burglary occurred at an address in Iron Mill Lane between 13.30 and 21.30. Entry was via a rear door, it was not reported what was stolen. Number plates were stolen from a vehicle parked in Farm Place between 18.00 on Thursday 31 January and 10.00 on Friday 1st February. These number plates OV53 VHJ should be on a Blue VW Polo. It was reported that between 09.00-09.10 on Tuesday 29th January a wing mirror was deliberately broken off a Ford Fiesta van whilst parked outside a property in Mill Place. Number plates KW10 GWV were stolen from a Black Volkswagon whilst parked in Perry Street on Saturday 2nd February between 12.15 and 14.30. Between 12.00 on Thursday 31st January and 14.15 on Saturday 2nd February a shed was broken into at Crayford Allotments, a quantity of power tools and gardening equipment was taken. A theft from motor vehicle occurred on Monday 4th February between 01.00-04.00 at Old Road. A small bag containing toiletries, a small flick knife and caravan keys were stolen from within a red Honda CRV, victim believes the suspect's intention was to steal the vehicle but it had a steering lock fitted. Our officers have dealt with 2 youths who had cannabis on them close to Halcot Avenue, their parents have been made aware. We were at Town Hall Square on Tuesday early evening with our partners from Peabody Trust to conduct house to house surveys about anti-social behaviour and disorder at that location and close by. Tackling anti-social behaviour in Crayford Town Centre is one of our current ward promises as agreed by our ward panel. Whilst there some youths were seen loitering in the rear of the underground car park and on seeing police ran off. A short foot chase ensued but the youths had too great a head start, they did however drop their lit cannabis joint which will now be destroyed. Many of the residents at Town Hall Square want us to be there to deal with the constant ongoing issues occurring there". Erith ward:- "Around Erith – A new café is opening soon, the bookstore café in the old Erith Library for more info have a look at this link: https://www.theexchangeerith.com/the-bookstore-cafe/ we will be popping in for a coffee every now and then supporting new local businesses. Also a free exhibition Windrush and Bexley's Story of Migration [exhibition] Sat, Feb 16, 2019, 11:00 AM - Sun, Mar 17, 2019, 4:00 PM. The Exchange Open Thursday – Sunday, 11 – 4pm. - Crimes of note: Burg Res (Burglary Residential) Sunday 27/01/2019 Rutland Gate - By suspect, breaking into victim's household whilst away, stealing several items and causing damage to several items + the household; Theft from MV (Motor Vehicle) Thursday 31/01/2019, St. Fidelis Road - Vehicle boot left unlocked and items taken; Burg Res Friday 01/02/2019 Crusoe Road - by suspect unknown gaining entry by smashing rear conservatory door to gain entry then remove property from within; Shoplift <£200 Saturday 02/02/2019 WM Morrison Supermarket, James Watt Way; Theft from MV 03/02/2019 Bramble Croft - front and rear number plates stolen from vehicle; Burg Bus (Burglary Business) Friday 01/02/2019, West Street - break in to a construction site. Community Contact Session date:- Thursday 14th February Erith Library". Northumberland Heath ward:- "One burglary reported to us over the past week in Belmont Road. This took place on the afternoon of Thursday January 31st between 3pm - 10.50pm when the occupiers returned to find the back door smashed and the house ransacked. A safe containing a large amount of cash was stolen along with a Rolex watch, a Louis Vutton handbag and office equipment to the value of£500. A Land Rover discovery was stolen overnight on Monday February 4th in the small hours of the morning between 0130 – 0620 when the victim discovered it missing when leaving for work .The vehicle was stolen with the owner still of possession of the keys. The victim has CCTV footage of three men in Balaclavas on their property, these males were believed to be driving a silver ford focus prior to the vehicle theft. Two theft from Motor vehicles in very close proximity to each other in Parsonage Manorway and Shinglewell Road. Both took place overnight on Thursday January 31st and Friday February 1st between 6pm and 8am. One vehicle had a bag containing £40 stolen and the other had a dashcam stolen. This week we had a meeting with Bexley council to discuss several youths who are still coming to police attention, we will update you with any further information in due course. Our next drop in Police Surgery will be held on Wednesday February 13th at Midday. All are welcome to attend". Slade Green and Northend ward:- "An armed robbery took place on Tuesday 05/02/2019. At 11:45 2 masked men entered the Post Office in Forest Road armed with axes demanding money from the tills. They got away with £600. Fortunately no one was hurt. The investigation is under way with the good news that one suspect has been arrested and hopefully the second will be caught soon. If anyone has any information relating to this matter please let us know or call 101. A vehicle was stolen from Cedar Road at some time between Saturday (2/2/19) and Monday (4/2/19) this week with no evidence of any smashed glass or stolen keys. The vehicle details have been flagged for the ANPR cameras. 2 positive searches this week. PC's Mark and James carried out some plain clothes work on Saturday 2nd Feb resulting in 1 suspect searched in Frobisher Road and found in possession of cannabis which ended with the relevant warnings given. Another suspect is coming back for an interview next week after also being found in possession of cannabis but denying any knowledge of it. On the morning of Saturday Feb 2nd police attention was drawn to an unattended motorbike with its engine running in the car park of Tesco Express, Northend Road. As officers went to go in the shop a male came out carrying £31 pound worth of chocolate, he said it was his bike. The bike was stolen as was the chocolate so he was duly arrested for both offences!" Thamesmead East ward:- "Burglaries - No burglaries to report this week. However remain vigilant at all times. Theft of motor vehicle - Between the hours of 02:00pm and 04:00pm on Thursday 31/01/19 a vehicle was stolen from Manordeane Road. Theft from motor vehicle - Between the hours of 07:00pm on Saturday 02/02/19 and 07:50am Sunday 03/02/19 a vehicle parked, locked and secure in Lensbury Way had the front passenger window smashed and a brand new tom tom valued at £220 taken from the glove box. During the early hours of Sunday morning of the 03/02/19 another vehicle parked in Lensbury Way had both the front passenger window and rear passenger smashed, an Apple mini iPad, Microsoft surface laptop, optical equipment and £350 taken from the glove box. Crime prevention - Wallets, purses ,handbags ,credit cards and loose change should never be left in an unattended vehicle. Remove sat nav mounts, suction cup marks on windows and cables which may indicate electrical items in the vehicle. Good news - On Friday 01/02/19 a male who resides locally was arrested for failing to appear, was kept in over the weekend and bailed to court. Meetings - Have A Say Day On Thursday 14/02/19 at The Link, Bazalgette Way between the hours of 1:00 – 2:00pm,an opportunity to meet with your local police team and discuss any concerns that you may have". West Heath ward:- "The ward has suffered two theft from Motor vehicles and two Theft of Motor vehicles. Between Tuesday the 29th January at 9pm -- Wednesday 30th January at 7.40am a vehicle was stolen without the use of the keys in Powys Close, a second vehicle was taken from Canberra Road again without keys between 11pm on the Monday 21st January and 7.30am Friday 1st February. Number plates were stolen from a vehicle in Clovelly Road daytime between 9.30am and 8.15pm on the Thursday 31st January. Petrol was stolen and the vehicles tyres slashed in Hurst Lane between Sunday 10th at 10am and Monday 11th February at 10am. We have been made aware by the residents of Glenview that person/s are informing them that un-necessary remedial works are required to their properties, they have also been offered services of driveway cleaning. Please be aware of unexpected callers offering these services. Please do not hesitate to contact police if you have any concerns about these callers. Our next Community Contact Session will be on Saturday the Saturday 9th February at Hurst Lane Estate between 1 – 2pm. The team have carried out arrest enquiries for persons who are wanted and now currently have only one person outstanding on the ward. We continue to carry out high visibility patrols in an attempt to reduce burglaries, ASB and drugs. We have delivered leaflets regarding drug activity in Heath Avenue and Powys Road". The end video this week is a documentary from 2014 featuring Welling born and raised musician Kate Bush; it makes for fascinating viewing. Please feel free to leave a comment below, or Email me at hugh.neal@gmail.com.